(Photo: United Nations)Ahmed Shaheed, Special Rapporteur on freedom of religion or belief. All States with blasphemy laws on their statute books should repeal them to increase freedom of religion or belief, a UN human rights expert has said in New York. 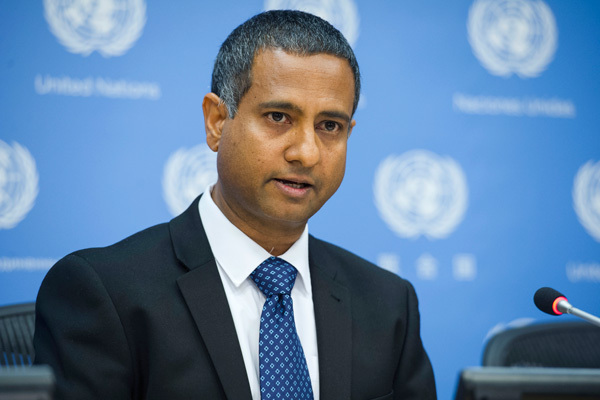 "Anti-blasphemy, anti-apostasy or anti-conversion laws, some of which are falsely presented as 'anti-incitement' legislation, also often serve as platforms for enabling intolerance," said Ahmed Shaheed Special UN Rapporteur on freedom of religion or belief. He was speaking Oct. 24 ahead of presenting his first report to the UN General Assembly in New York since he was appointed in 2016. "I urge States that still have blasphemy laws to repeal them because of their stifling impact on the enjoyment of the right to freedom of religion or belief, and on the ability to engage in a healthy dialogue about religion," Shaheed said. He said it is essential to address the rising global trend of religious intolerance, and to close the gap between commitments to combat intolerant acts and taking appropriate action. "Today, three quarters of the world's population live in countries that have, either restrictions on the right to religion or belief, or a high-level of social hostility involving religion or belief," said Shaheed. "In many cases, limits on freedom of religion or belief and denials of that freedom, which result in religious intolerance, stem not from any governmental action but from pressures within the society in which they occur," he noted. Intolerance can be caused by extremist interpretations of religious sources, Shaheed said. Violations are often aggravated in situations where "intolerance levels are at their highest, rule of law is at its weakest, and fear is the common currency, including in situations of conflict." The UN expert said violence by extremist groups, often in the name of religion or belief, is a real threat that had to be confronted. But the increasing trend by States to politicize religion or link it with security concerns worsens the situation, he explained. "What is often overlooked is the role many governments play in exacerbating, fueling and enabling an environment in which such extremism can flourish," he said. He warned that an based on too much security to countering violent extremism in the name of religion had often proven to be counter-productive. Shaheed, former foreign minister of the Maldives, encouraged everyone to recommit using the existing UN tools and mechanisms to close the gap between commitments and action.